Saltaire is a purpose-built "model" Victorian industrial village, next to Shipley and just to the north of the centre of Bradford in West Yorkshire's Bronte Country. The village itself was built in the mid nineteenth century by the Victorian philanthropist Sir Titus Salt to provide self-contained living space for the workers at his alpaca wool mill - a welcome alternative to the then "dark satanic mills" of Bradford and nearby Leeds. More recently (in the 1980s) Salt's Mill was converted by the late Jonathan Silver into shops and the "1853 Gallery" which houses a collection of the works of the famous artist, David Hockney (who was of course born in Bradford), a development which sparked a renaissance for the village. Of particular interest is the United Reformed Church - one of the nation's most precious Victorian buildings and a unique example of Italianite religious architecture. Close nearby are Hirst Woods and also the local beauty spot of Shipley Glen (which can be reached using the Victorian Shipley Glen Tramway - a historic funicular dating from 1895). Further afield (and also worth a visit) are the villages of Haworth and Thornton (famous as being the birthplace of the Brontes), the spa town of Ilkley, and the beautiful Yorkshire Dales to the north. With its Bohemian feel and Hockney connections, Saltaire village has become a magnet for artists, poets, writers and musicians. Every year the village hosts the very popular Saltaire Festival (which is usually held in September), and the Saltaire Arts Trail (which is now usually held earlier in the year). There is also the Aire Sculpture Trail (a permanent collection of sculptures and other works of art which runs through the village along the River Aire and the Leeds Liverpool Canal) and at Christmas in the village there is a "living advent calendar" too! 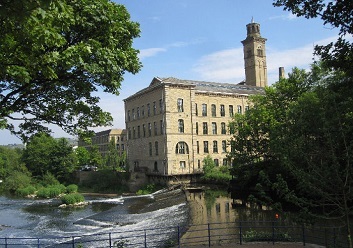 Please click here for information for disabled visitors to Saltaire and the local area. 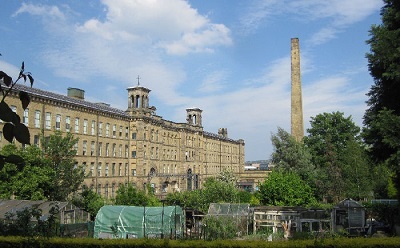 Please click here for links to other Saltaire, Shipley and local information sites.